To save money and calories, skip buying the grilled chicken breast at the store and make Simple Grilled Chicken (click here for recie) instead: Just follow the recipe exactly, swapping out the garlic and herb seasoning for a Mexican or Southwest seasoning (I use Mrs. Dash Southwest Chipotle). Also, be sure you either wear gloves or wash your hands immediately after working with jalapeños. Though you’re sure to love this dish, you won’t enjoy it nearly as much if your jalapeño-affected hands make even minimal contact with your eyes. 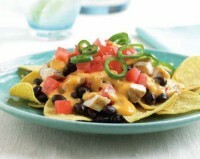 1 ounce baked tortilla chips (I used Guiltless Gourmet) 1⁄4 cup drained canned 50% less-sodium black beans, heated 4 ounces grilled extra-lean boneless, skinless chicken breast, cut into small cubes, reheated if necessary 2 tablespoons salsa con queso, all natural if possible (I used Salpica), heated 3 tablespoons finely chopped seeded tomato 2 tablespoons thinly sliced jalapeño chile pepper (wear plastic gloves when handling) Lay the chips on a dinner plate. Top them evenly with the beans, followed by the chicken. Drizzle the salsa con queso evenly over the top. Top with the tomato and jalapeño slices and serve. 1.Lay the chips on a dinner plate. Top them evenly with the beans, followed by the chicken. Drizzle the salsa con queso evenly over the top. Top with the tomato and jalapeño slices and serve.